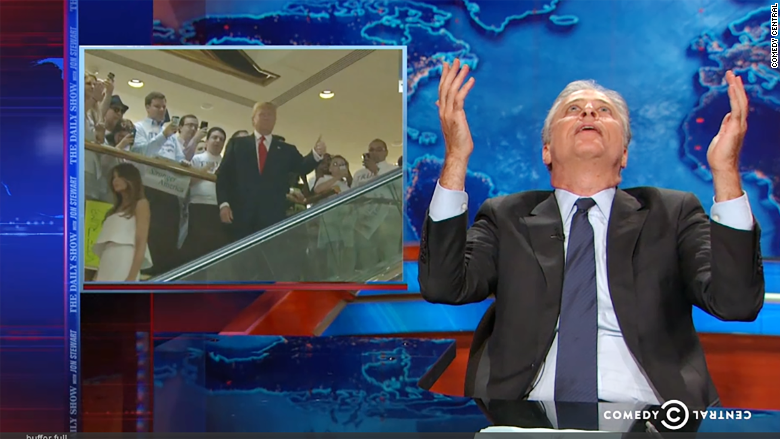 Jon Stewart thanked the heavens back in June when Trump announced he was running for president. Donald Trump claims that Jon Stewart, one of his biggest critics, wants him to be a guest in the final days of "The Daily Show." A source in Trump's campaign confirmed the invite to CNNMoney on Thursday. The news of Trump's invite was first reported by the The Hill. "I like Jon Stewart — I think he's good. They're begging me to go on," Trump told The Hill. "I would do it ... the problem is it looks like pandering. It looks so false and so phony if I do it." If Trump does go on, it would immediately become event TV, and would be a great going away gift for Stewart who is signing off on August 6. Comedy Central, the network of "The Daily Show," did not immediately respond to a request for comment. Stewart, who is ending his 16 year run as the host of the comedy news show, has with glee taken on Trump since the mogul announced he was running for president. "Thank you Donald Trump for making my last six weeks... my best six weeks," Stewart said back in June. "He's putting me in some sort of comedy hospice where all I'm getting is straight morphine." Since then Stewart has ripped into the candidate over his comments regarding Mexican immigrants, Sen. John McCain, and Trump's signature hair. "I agree that making fun of someone's appearance is a cheap blow," Stewart said on Monday's show. "But that hair is comedy entrapment." Earlier this week, President Obama was a guest on Stewart's show. During the show, Stewart and Obama joked about Trump's prominence in the Republican presidential race.